If today has taught us anything, it's that Lenovo doesn't like keeping its feet on the ground. The company's crazy concepts and ideas department, which is obviously not getting along on a shoestring, hasn't been dragging its feet in the last year. It has just unveiled a new Smart Cast phone concept, a Magic View smartwatch prototype, and now it's time for the other shoe to drop — literally. 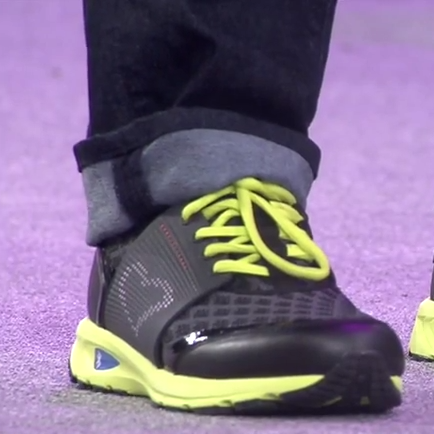 Lenovo's Smart Shoes track fitness data (calorie consumption, heart rate) and provide maps and directions, but their built-in LEDs are a shoo-in for the best feature. Using your phone, you can draw anything on the shoes — a heart, a smiley face, an ice cream cone, a middle finger maybe? — and I swear I'm not even pulling your leg. Whether you're head-to-toe happy, have itchy feet, or need to cool your heels, you can light up the floor and have other people walking in your shoes for a second. Lenovo is keeping us on our toes regarding these Smart Shoes' potential market availability, but the demo'ed prototype seems to already have one foot in the door. All it needs is to dig in its heels and it'll have the world at its feet. I, for one, wouldn't mind footing the bill for these shoes, if only to answer some pressing questions: if you draw a checkmark on them, do they become Nike branded shoes? If you draw footsteps, will people ask you who stepped on your shoes? Maybe, but I don't have a leg to stand on. All that I know is that this kind of brainless fun is definitely helping me start this I/O day on the right foot.